"Tino the Fluffy Red Elf"
We are located near Idaho Falls, Idaho and love dogs! We are home-based professional breeders committed to optimal health and happy puppies. Superior pups don't just happen and we take great care in continuing education, appropriately health-testing as recommended, feeding & recommending holistic products and stand behind the overall health and well-being of each & every puppy that leaves our homes. We are very busy working full-time with the dogs around the clock, ensuring proper care & one-on-one attention and love! At Idaho Jewels, we spare no expense when it concerns our animals. All receive only top quality veterinary care & holistically-formulated nutrition! Our dogs live the ultimate life of luxury! We do NOT kennel our dogs (except at night to keep them safe) and they live normal lives at home within our loving families! Our puppies are raised in our homes and since socialization is a crucial development to puppies, we start from day one including these prized pups into our lives until they they become a part of your family! 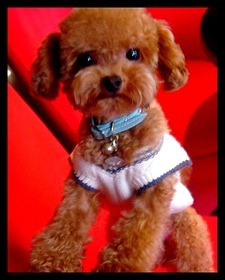 We are the proud home of Taiwan's first and famous red "teacup" poodle! We are inspected by AKC and have always been found in full compliance! "Idaho Jewels Poodles is one of our most influential breeders"
Recall-Free & made fresh in the USA, shipped directly to YOU! Inspired by Nature, Informed by Science!